The camera used an optical zoom for the picture on the left and a digital zoom for the one on the right. Optical zoom: If taking a lot of photos from far away subjects is important to you, be sure that the camera you buy has an optical zoom. An optical zoom is a true zoom lens, like the zoom lens you’d use on a film camera. They produce much better-quality images. 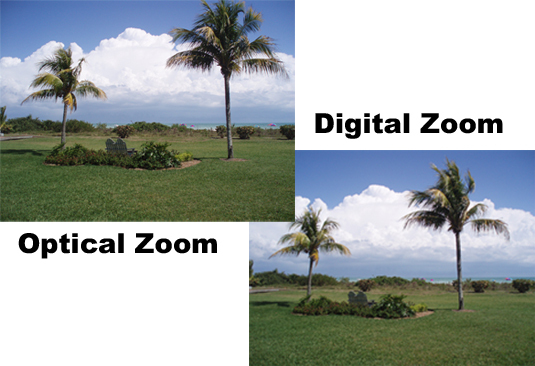 Digital zoom: Some cameras offer a digital zoom, which is simply some in-camera image processing. When you use a digital zoom, the camera enlarges the image area at the center of the frame and trims away the outside edges of the picture. The result is the same as when you open an image in your photo-editing program, crop away the edges of the picture, and then enlarge the remaining portion of the photo. Enlarging the “zoomed” area also enlarges the pixels and reduces the image resolution and the image quality.